It was a dark December day with freezing rain poring sideways in the stiff gale when Blue Daisy was lifted in Ellös for the first time in a very long time. 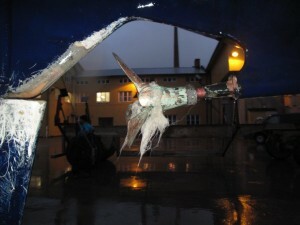 I believe the rig has never been taken down ever since the boat was new and was launched in Ellös in 1999. 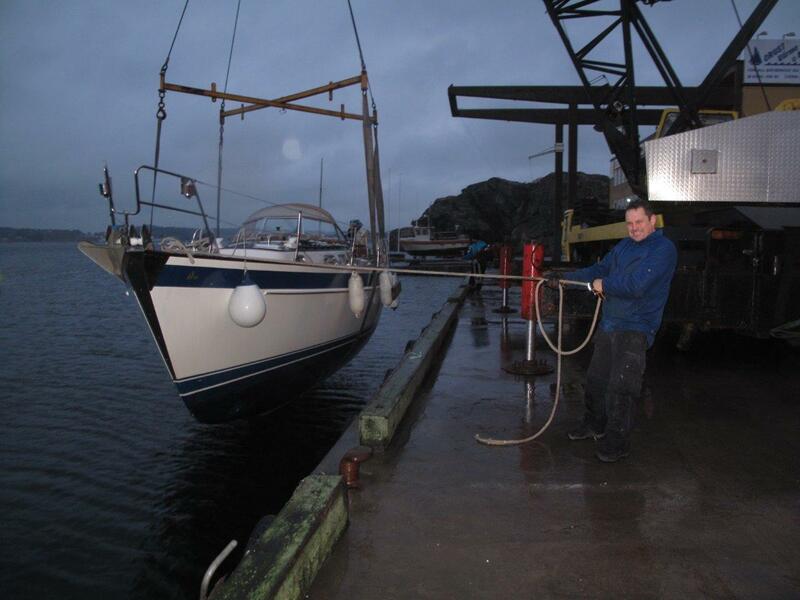 The refit team of Ellös works efficiently and has great experience in lifting boats. 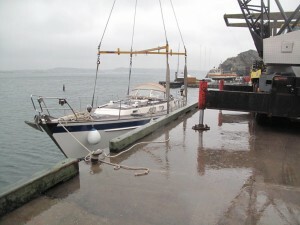 Stellan and Carl work together like a Swiss clockwork and do not have to say much to each other while the Madame of 20 tonnes is hoisted out of the water and carefully placed onto the readily prepared trailer that takes her up to the premises at Slätthult in Ellös. The lifting went as planned but the surprise came when Lady Blue Daisy showed her bottom for the first time, if I may express it so boldly. „I am sending photos of the shaft as the flange has moved and the inner tube has pulled out aft. There was a fishing net in the propeller as well and marks that the boat has ridden over something in the water. 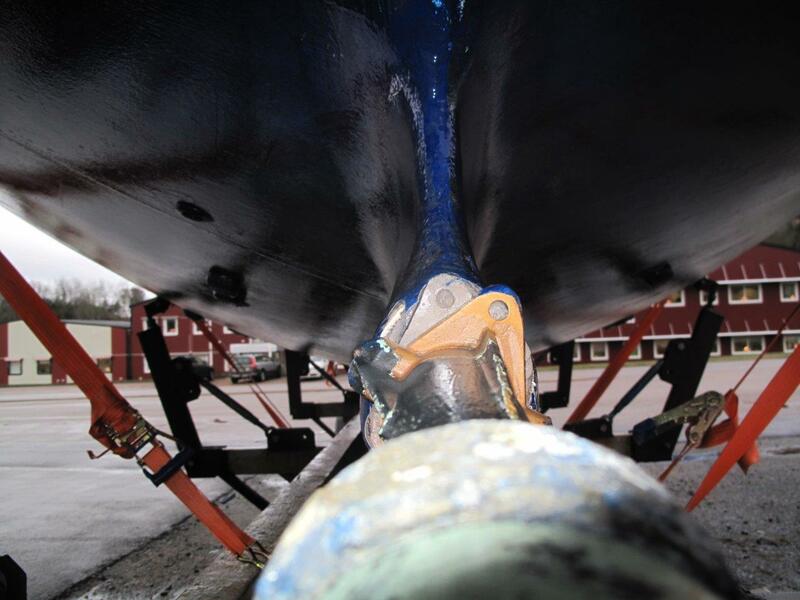 The delivery skipper who sailed her from Ibiza to Ellös said he noticed nothing wrong with the boats performance, but above 2000 RPM it sounded like bubbles on the hull. 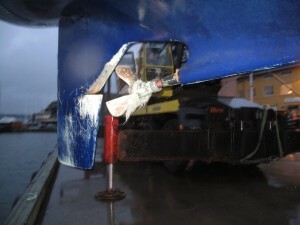 The paint has rubbed off around that area and the prop was fouled. When I drove the boat over from Ellös Marina to the crane, I noticed no vibrations, either, but sure it looked frightening when we saw what had happened to the propeller once the boat had been lifted. After all the delivery crew had to go through with harsh winter weather over the Bay of Biscay and the North Sea, this could have been disaster for them! We can only thank our Saints and lucky stars that the boat was not crippled and forced to sail downwind off into the open Atlantic during that North-Easterly storm or something horrible! So far Carl Adams. Personally, I can just agree that it is so good to have the boat refitted with professionals who really know these boats and have seen most issues before. It´s like coming home to a doctor who looks at you and then says you will soon get well again. Sometimes no more is needed than to hear an expert express that all will be fine in order to feel so much better immediately. For sure, Blue Daisy is in good hands! 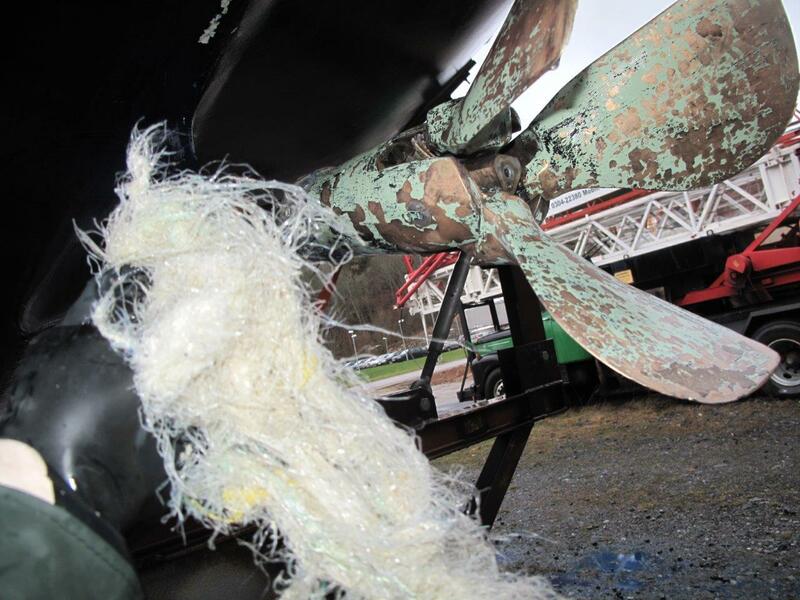 And besides, these pictures give yet another confirmation that a good rope cutter, such as the Ambassador Rope Stripper, is a good investment and an essential piece of safety equipment. Artur therefore agreed without any hesitation that he wished us to install a rope cutter as part of his refit.